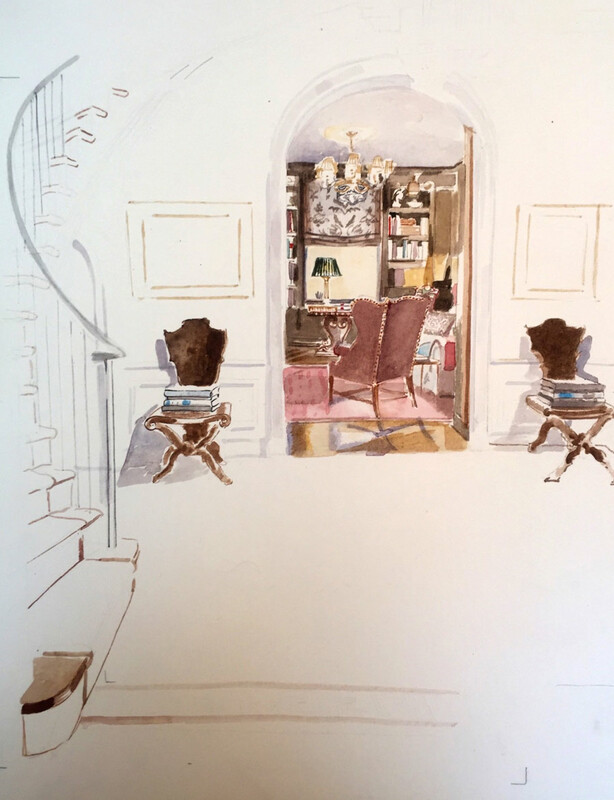 Mita Corsini Bland is a New York based watercolorist specializing in interior renderings. Read more about the artist here or please contact her for further information. Mita was born in New York and raised outside of Florence, Italy. She attended Aiglon College in Switzerland, and graduated from Wheaton College Mass with a BA in Art History and minor in Anthropology. Postgraduate, she completed Sotheby's Works of Art Course in London, after which she ran Sotheby's Islamic Art Department in New York. After having her first child she decided to pursue painting, and took courses in watercolor at the National Academy of Design, Parsons. and the Art Student's League. Since 1985, Mita has focused on watercolors and painting interiors. Her clients have included decorators Veere Grenney, Miles Redd, Alex Papachristidis, and Mario Buatta as well as private clients such as Michael Bloomberg. For several years she did the illustrations for Brunschwig & Fils' wallpaper book. Her illustrations have appeared in magazines, House Beautiful, Town & Country. She illustrated Sister Parish Design: on Decorating by Susan Crater and Libby Cameron (St. Martin’s Press, 2009). Mita lives in New York with her husband, fine art and furniture dealer Gerald Bland, her three grown children and English cocker spaniel. I paint mostly room renderings in watercolor. There is something about the way the shapes of architecture, furniture, the perspective, the rhythm of light and shade contribute to an exciting interior landscape. Drawing an interior is like figuring out a puzzle, once all the cross references of lines and shapes have been taken into account, it all comes together. It is an exciting moment for me, one that keeps me going, looking forward to coloring the painting. Often less is more, I use less and less color but concentrate instead on the play of lights and darks often using one color, or perhaps two for accent. My botanical paintings are all about shape and my reference point is often Islamic calligraphy, particularly Kufic writing. Pared down, simplified, the emphasis on shape, curve, one or two colors defining shadows. I have always enjoyed sketching - capturing the likenesses or gestures of people, often unbeknownst to them. Family caricatures sent as Christmas cards have led to commissions for invitations, birthdays, announcements, and openings. Limited edition prints of Mita's work are now available through Tiger Flower Studio and Gerald Bland.